The Big Wobble: Missile test, space junk or a meteor? I must say it looks far to slow for a meteor. Yesterday! A fireball which streaked across the sky in the western United States caused social media to light up back on earth. 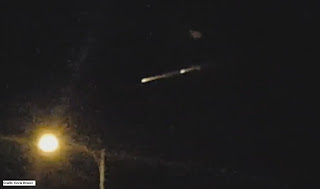 The blazing spectacle spotted in Nevada, Utah and California, has also left space experts divided over what it was.